Get ready to travel back to the Lost Lands to fight dinosaurs and rifle-wielding savages. Turok: Dinosaur Hunter is back on a Nintendo Console and now it can be played anytime, anywhere. In a time before the millennium, circa 1997, one man fought against savages, dinosaurs and defeated the Campaigner. His name was Tal’Set, aka Turok and was one of the most badass video game characters to grace the Nintendo 64. Turok, also known as Turok: Dinosaur Hunter is a video game adaptation of a comic series of the same name. The comic series was acquired by Acclaim, which released their own series of comics. The company then used the Turok IP to create the first-person, shooter, and platformer that released on Nintendo 64. The game was developed by Iguana Entertainment and published by Acclaim Entertainment. The game received positive reception from critics and spawned a number of sequels, a reboot and a multiplayer Deathmatch spin-off. Turok didn’t stay exclusive on Nintendo Consoles for long, After its initial release on the N64 on March 4th 1997, it later released on Windows later that year on November 26th. Nightdive Studios then remastered the game for Steam on PC in 2015. Turok Remastered saw a new lease of life again, when it launched on Xbox One in 2018. Now, after 22 years since its original release, Turok has returned to a Nintendo console and has made its way onto the Nintendo Switch. The Story of Turok follows Tal’Set, a Native American Warrior of Saquin Descent. He journeys to the Lost Land in order to stop the Campaigner who plans to assemble an ancient alien weapon known as the Chronoscepter. The Campaigner wants to use the weapon and magnify its power in order to break the barriers between the Lost Land and the other universes. To stop the Tyrant, Tal’Set heads off to seek out the 8 pieces of the Chronoscepter that have been scattered over the 8 levels of the Lost Lands. When you begin the game, you are armed with only a knife and a bow. As you progress, you will find more weapons from a pistol and shotgun up to more high tech weaponry, including the all-powerful Chronoscepter itself. Some weapons also have ammunition that is more powerful. The Shotgun for example, has both standard and explosive shells. However, you cannot switch between the two ammo types so you will have to use up all of your powerful ammo back before you can use the standard again. With very little direction, you must navigate your way around each of the labyrinthine levels to find one of the 8 pieces of the Chronoscepter. You also need to find Level Keys that will unlock the other levels that will lead to the other Chronoscepter pieces. Turok is primarily a run and gun title, much like Doom and Wolfenstein. You will face many different enemies including Raptors, Savages and monstrous primates that want nothing more than to tear you apart. The Human enemies can be done away with the knife if low on ammo but there is usually plenty about so you don’t have to worry about ammo conservation too much. Being a platformer as well, you will certainly get your fair share of platforms to jump to and from in order to reach other areas. Sometimes, you will have to venture through dank caves or swim through pools and tunnels to reach your destination. There are also plenty of hidden routes off the beaten path as well that can lead to secret areas. These routes and areas do not appear on the Map, so you will have vigilant. The Chronoscepter pieces are hidden in these secret areas as well, which gives more reason to look out for them. Turok is by no means a straightforward “Get from Point A to Point B.” There are also some puzzle aspects as well. They usually consist of finding a hidden switch in one part of the level, which opens a door in another part of the level. Some are timed as well, so you will need to be quick on your feet to reach the newly accessible area before the door closes again. Dotted about on each level are small obelisk-like objects that allow you to save your progress. There are about one or two obelisks per level and are usually followed by more challenging sections like enemy-filled areas or pillars descending down to bottomless pits. Turok is tough but he is by no means immortal. You have to keep your health up by collecting the crosses which are scattered all over the level or dropped by some enemies when they die. There also triangular objects that when 100 of them are collected, they will grant you an extra life. Turok requires the use of both Joysticks to control movement like walking and turning. The left joystick moves Turok forwards, backwards and strafe left and right. The right joystick helps controls where you look around and aim. The L & R trigger buttons are used to change between weapons. The ZR button fires your current weapon and the ZL button is used to jump, though you can also jump with B. The Y button is used to bring up and remove the overlay map that appears on the screen. The A, X, Left and Right directional button are redundant by default. You can however, map actions to them like swap weapon, fire and jump. The up and down directional buttons are used to zoom in and out of the map. One feature that was not included in the original game was gyroscopic controls. Though completely optional, you can activate gyroscopic controls to look around by moving the Switch or Pro Controller / Joy-Con Grip. The Pro Controller doesn’t seem to have as much freedom of movement as the Switch does but you can adjust the sensitivity in the settings. Another welcomed feature that wasn’t present in the original game was achievements. These were most likely added for the Xbox One version but have been kept in for the Nintendo Switch, thus it’s a nice little extra to have and gives players a little extra something to do. When it comes to graphics, if you were hoping for a fully remastered game with state-of-the-art textures and super realistic visuals, you will be disappointed. Turok has been faithfully remastered to maintain the original models, textures and effects. Improvements have been made to the remastered version though. The draw distance is much further so you can see further and spot enemies much easier. The graphics are much sharper as well, giving more distinction to the plants, statue patterns, characters, etc. The music and sound effects are just as they were from the original game. If anything, they have probably been cleared up a little more. The sound of the tribal war drums that bang in the background play throughout the entire game. Though it can be a little repetitive at times, I still enjoy listening to it and find it adds to the game’s tribal charm. There is also an option to change the Audio track altogether between two versions: the original N64 version and the slightly later released PC version. I can’t tell much difference between the two but it’s nice to have the option of choice. Turok is a classic but it did have its flaws, which have returned with the remaster. The enemies seem to have 100% accuracy, which makes evading them troublesome. The enemies don’t flinch from attacks either, so those that take more hits to take down can still fire upon you without pause. Judging jump distance can be irksome as well, especially on narrow platforms. You have to constantly maintain your view towards the floor below you so you don’t miss your footing. The fact that you can’t change between ammo types is unfortunate as well as it forces you to use up your more powerful ammo instead of conserving it for more powerful enemies or bosses. On the plus side, these issues were addressed for the second game, which is one of my all-time favourites on the N64. Turok is still as challenging as it was back in the day. It also helped redefine a genre with realistic graphics (back in the day when it originally released). There are also a load of gameplay and graphic features that you can tweak to your own preference. If you don’t like the bobbing motion of your weapon or want to extend the Draw distance, you can. If you want to turn of death cinematics or turn off the blood splatters, you can do that too. These little perks help cater to those that didn’t that aren’t fond of things like the head bobbing and the like and gives players the chance to turn such features off and on when they feel like it. You can also change the difficulty on the fly as well. Turok was a game that I always held with fond regard. Though I first dipped my toe in the series with Turok 2: Seeds Of Evil, I am glad that I can experience the world of Turok all over again on a Nintendo Console. The game is far from perfect but that is still part of its charm. In what game can you fight bio-engineered dinosaurs with guns, whilst fighting savages with plasma rifles? Then having to deal with extraterrestrials as well? 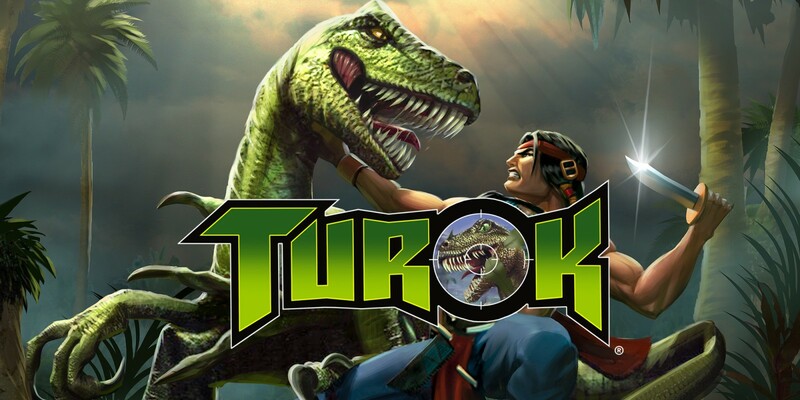 Turok Remastered on Nintendo Switch is a welcome return of a series that I have long enjoyed playing back in the day and will continue to play. Only now, I can play anytime, anywhere and it is all thanks to the brilliant team over at Nightdive Studios. For this price, they should give as well the second opus.